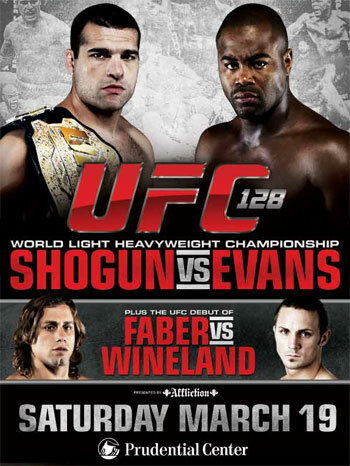 If you thought last week’s highly-anticipated return of MTV’s Jersey Shore was big news in the Newark area, “UFC 128: Shogun vs. Evans” will take fist-pumping to a whole new level. Tickets for the blockbuster extravaganza go on sale Tuesday morning. The star-studded card takes place March 19th inside the Prudential Center in New Jersey. A light heavyweight title scrap between champ Mauricio “Shogun” Rua and Rashad Evans will headline the pay-per-view broadcast. UFC Fight Club members will have the opportunity to purchase seats for the show this morning at 10AM ET/7AM PT via UFCFightClub.com. The general public will have access to the remains on January 13th at 10AM ET/7AM PT.